It is envisaged that the Holt Owl Trail will bring a sense of pride into the community. Residents will have a greater awareness of the significance of their town and how it's humble beginnings as an early settlement for timber gradually developed to become an important trading centre, recognised today as one of the finest shopping destinations in Norfolk. The trail provides a greater understanding of the town centre, why its layout has remained so compact and where fine buildings have secured its rating as a conservation area. Particularly of interest to newer residents will be the stories that unfold revealing the significance of why properties were named and where characters of Holt in past years actually influenced the naming of buildings and streets. There will be a fascinating insight into the reasoning behind Holt's network of Yards, how they developed to enable the town to expand 'behind the scenes' and how they now integrate and support the town centre. Changes in social behaviour will be illustrated through Holt's enormous number of public houses that have all but disappeared, yet the properties can still be identified and will feature along the Owl Trail and their names will hopefully be remembered as a result. For example, how many of our residents today know that Star Plain, White Lion Street and Bull Street were named from public houses in those localities? It may not be apparent today just how Holt has changed. The town once boasted cinemas, a snooker club and a magistrates court, but it also changed dramatically when the railway was lost, the livestock market closed and the race course ceased to exist. All these stories will be revealed through the Holt Owl Trail and the entertaining, informative, colourful brochure will serve to highlight, educate and bring a greater understanding of the town's sense of place. The Holt Owl Trail has an appeal for all age groups and is initially designed as a light-hearted introduction to the town centre encapsulating all the main thoroughfares with additional links to reveal some of Holt's hidden locations. Its concept is to facilitate educational opportunities with accompanying literature to highlight Holt's rich heritage through the provision of historical references, architectural information and interesting anecdotes. 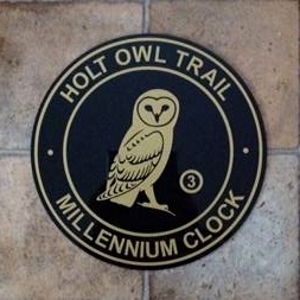 However, a more serious aspect of the Holt Owl Trail is to assist in the commercial regeneration of the town. The acute shortage of car parking facilities in Holt has seen a dramatic downturn in footfall and the commercial success of the town is already suffering as a result. Town centres throughout the UK are in sharp decline, threatened by internet shopping and out-of-town retail parks, so there is now a real need to find imaginative ways to rejuvenate interest in our High Streets. The creation of a trail will provide visitors with a 'whole-town' experience on a structured route to encompass all aspects of Holt's commercial, cultural and visual appeal. Unlocking the town's lesser known areas will uncover some of the fascinating historical links and architectural highlights which have shaped the town's history from its earliest roots, originally as a settlement supplying timber.